Data Center & Colocation Services for Calgary, Vancouver, Toronto. 1/2 Rack, Full Rack(s) or Suites. We also offer 1U, 2U, 4U..any U Shared HSE "High Security Enviroment"
Solid, lock-tight secure, robust connectivity and featuring 100% SLA, our mission-critical Data Centre in the heart of downtown Calgary features scalable services at its best. Colocation of your server is a serious undertaking, with lasting consequences to your business. Choosing a partner that can provide an Enterprise Environment that can adapt to your needs is crucial. We are a truly Canadian company…located in Calgary Alberta Canada and managed by Canadians. Why consider us for your colocation needs? 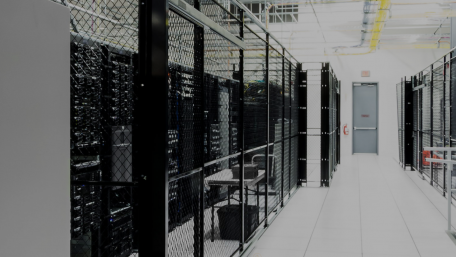 Our Calgary data center provides a safe, climate-controlled environment with access to high bandwidth Internet for hosting mission-critical network equipment and web servers. Why a Calgary Data Center? Businesses realize the benefits and needs that come with a high-level Data Center that provides a mission-critical server environment. Colocation is a smart choice for companies. We offer a cost-effective and enterprise environment with huge savings. HostedinCanada’s Data Center is conveniently located at in the heart of downtown Calgary’s main business district. When it comes to power and the internet in our data center, we provide 100% reliability. In 2013, Calgary was consumed by floods that overtook most of downtown Calgary and the surrounding areas. During this disaster we are proud to say we never had a moment of downtime. Our engineers and staff kept the facility running the entire time. Backup diesel generators are on standby and tested regularly. The power, internet, and HVAC are all integrated into our redundant systems. Depending your needs we offer a variety of back-up options including off site, daily and VPS disk to disk backup. Server security is a must and every client has unique needs. That’s why HostedinCanada offers dedicated and customized hardware based firewall solutions with private custom port configuration. Looking for a Colocation program that is maintenance free? We offer hands on support including but not limited to hardware swaps, reboots and more. Is your server or website up? In the past year, 41% of web servers have had substantial downtime. We offer server and website monitoring services based on 15 minute intervals, 24×7 365 days a year, sending you notification by email, SMS, pager or ICQ. We get it, you only need enough room for a couple of servers. BUT, you’re also looking for redundancy, security and an environment you AND your clients can trust. Welcome to HostedinCanada.com! 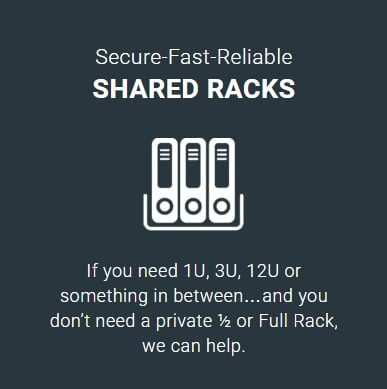 If you need 1U, 3U, 12U or something in between and you don’t need a private 1/2 or Full Rack, we can help. Our secure, climate controlled server colocation environment allows our clients to build and scale their on-line business needs as their requirements evolve! Check out the video below for a detailed tour of our data center. HSE = High Security Environment. All visiting tech’s are escorted. Looking for a private ½ or full rack to collocate your servers? It may be surprising to hear, but we get calls from all types of business who currently keep their servers in office closets and back rooms with zero redundancy…and of course the threat of theft. Companies that rely on their servers to do millions of dollars in business, every year. ARE YOU IN THIS DANGEROUS PLACE? We can provide server collocation solutions that allow your business to grow, and protect your business, all the while providing consistent uptime reliability. What would you do if your servers went off line for a couple of days? 24×7 access for YOUR pre-approved and key staff only. Redundant Internet in bundled configurations to save you money. Are you looking for that next level of Data Center quality and control? Our Suites provide organizations a highly private and secure collocation solution to house their ICT (Information Communication Technology) environments. We offer private suite collocation options at an affordable price with an exceptional environment. For clients seeking greater privacy, these highly secure collocation environments give you what you need. Private rooms within our Calgary Data Center facilities and can be custom tailored to your exact requirements. Contact us and we will gladly help customize a private suite that works for you and your business. Please let us know if you have any questions. We’ll always available to server you.